Former Celtic goalkeeper Pat Bonner does not think that Ronny Deila will have done enough to extend his stay as manager even if his side win the title. It would be Celtic's fifth in a row - and their second under the Norwegian. But his side were beaten in the Scottish Cup semi-final by city rivals Rangers, the Championship winners. "It is going to be difficult for him now," Bonner told BBC Scotland. "I've always said that a cup and the league would be the expectation this year." Celtic lead Aberdeen by eight points with five games remaining in the Scottish Premiership, but they also lost in the semi-final of the League Cup, beaten by eventual tournament winners Ross County. Despite Sunday's defeat by Rangers on penalties, indications are that major shareholder Dermot Desmond and chief executive Peter Lawwell will give Deila at least until the end of the season. "Now the cups are gone, the league is left, they will win the league no doubt," said Bonner. "Will that be good enough to keep him in a job? I'm not so sure. "It is a decision Peter Lawwell, Dermot Desmond and the board of directors will have to make now." Celtic failed to reach the Champions League group stage and finished bottom of their Europa League section. "They didn't have a good European campaign and they've played in bits and pieces," said Bonner. "Maybe people put too much emphasis on Champions League, but for this club that's the target - to be in the group stages. "It has been done in the past and that's what any manager should be judged on." Last season, Celtic eased aside Rangers 2-0 in the semi-final of the League Cup on their way to winning Deila's first trophy as manager. "I think Rangers have made dramatic strides compared to what we saw last year in this same type of fixture," suggested Bonner. "They really have improved, there is no question about that. They play a good brand of football and the players look a lot more confident than they did. "So, from that point of view, Celtic haven't really progressed." Former Rangers midfielder Derek Ferguson also doubts whether Deila will be in charge of Celtic next season. "I think it was last chance saloon for him," he said of Sunday's semi-final. "I don't think Ronny could afford to lose to Rangers. 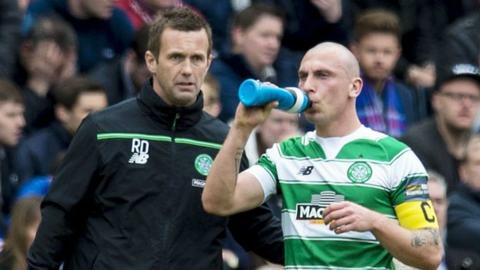 "He will have the championship in the bag, but I think it's now for Ronny and Celtic to move on and I think they'll need to bring in a new manager sooner rather than later."